Welcome back to Wordless Wednesday, a fairly recent little series I am doing on the beautiful art of wordless books. If you missed my tips on how to read a wordless book, start there. But today I want to share a heartwarming, powerful, moving, thought-provoking book with you. It is a story of loneliness, friendship, bullies, restoration, and so many more things that it is shocking to believe they can be handled and wrapped up so beautifully in a 40 page picture book. I am also thrilled that the creator of the book took the time to answer my questions and I have that little interview too! Let’s look at Bluebird by Bob Staake, 2013. The book beautifully begins from the cover with the little bluebird flying through the end pages, the title page, and onto the spread above where it takes interest in the small boy of the story. It is an incredible opening to the book, something I don’t think I have ever seen before, where every single page contributes to the arc of the story. The bluebird watches the boy in school and observes his loneliness and the way other kids poorly treat him. On the way home from school, the boy notices the bluebird following him. Through a fun sequence of moments, the two become friends and enjoy making their way through the park. That is, until they reach a dark tunnel and are greeted on the other side by some of the unkind boys at his school. There is a nasty scuffle, possible victory, and then disaster strikes as one of the boys inadvertently strikes the bluebird with a stick. The bird is down and the shock causes the bullies to run away. The boy cries and gently holds his little friend until more colorful birds join him in a beautiful, surprising conclusion where the bluebird is set free to fly into the clouds. Whew! That is a terribly condensed, brusquely worded description of a story that unfolds so perfectly in many panels and wordless spreads. 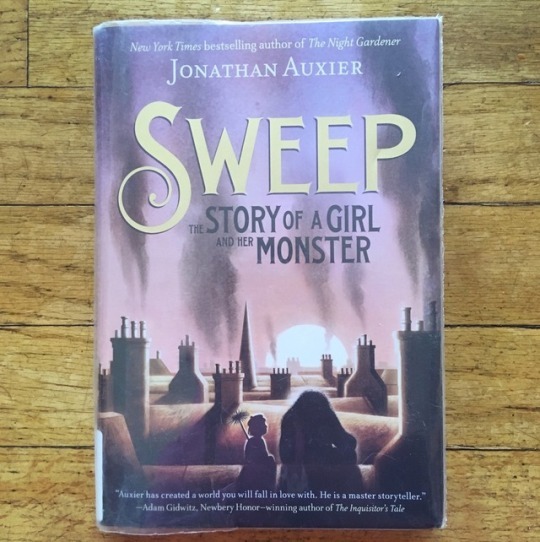 When I first read this book, I found myself mildly shocked at how light and airy the cover feels compared to the depth and intensity of the story. I am impressed with how carefully and masterfully Staake molded the story and handled several touchy subjects for picture books. I also continue to find the ending to be slightly confusing and yet intriguing because of that. Every read I find myself pondering what really happens to the bluebird. I actually like that about the book. When I think about the kind of things a typical kid goes through every day and how mildly terrifying everything is and how very little concrete answers there are to anything—a story like this makes perfect sense. There is something beautiful about an open ending and it leaves much to the imagination and contemplation. My very tiny sidenote to the whole book is how much I adore that it is set in New York. So many little background details peek out in every reading and I love searching and feeling connected to them. It isn’t important to know Manhattan to appreciate the story, but it is an added bonus of delight. And if you know the backstory of how Bob Staake was walking through Central Park, observed a bluebird seeming to follow him, and that sparked the idea for the book; it makes the setting of the book even more special. But let’s get down to it and unfold why I think this wordless book works so well. First, my standard simple plot translated into deep pictures theory completely explodes for this book. The plot is not simple in the least, and yet, Staake is able to strip it down to the most important and heaviest emotions and illustrate them in a way that is beautiful to view and easy to follow. Second, the pacing would be entirely overwhelming for the full arc of this story; but panels, movement, and zooming are used masterfully to carry the story at a brisk but wholly comprehensible and enjoyable pace. I actually love that the combination of Staake’s illustration style and the heavy paneling feel almost graphic novel in format as it gives the reader complete authority in how to pace the reading. It works because the reader is delicately guided through the action with varying steps between panels and occasional close-ups on important pieces of information. Third, the illustration style is absurdly perfect. If I were to consider sharing a story about a traumatic experience of bullying and possible death, I don’t think I would choose geometric figures to illustrate. But Staake took two very intense subjects and balanced them out with his signature illustration style which adds humor and space. I am seriously awed to see the range of emotion the characters are able to emote in their very basic shapes. Lastly, the touch of whimsy added with the illustration style is perfectly cloaked in a subdued, serious palette of blues and grays. The quick movement and actions are more digestible with the stripped down colors. It is always much easier and more artistic to view an intense moment in black and white than realistic full color. But, the ending also brings in the gorgeous spectrum of other birds and an increasing amount of white and space to aid in releasing the heaviness of the subject and the intensity of the story. While the ending may be open to interpretation, it still feels conclusive. And now, I am honored to share some insights to the book and to reading wordless books with a Q&A with Bob Staake himself. This man seems to be a whirlwind of activity and creative output, so I am thrilled to have captured a little of his time. Please welcome Bob Staake! Question: What motivated you to create a wordless picture book as opposed to a traditional text + illustration book? Bob Staake: If you look at all my picture books, each is a little different from the previous. That’s because I try to write and illustrate in unexpected ways all the time in an effort to keep myself engaged, challenged, and out of my comfort zone. I always knew that the boy and the bluebird wouldn’t be able to communicate through a shared dialogue, so it only made sense to have them connect through some sort of visual and intuitive means of expression—and without the use of words. Q: Was there ever text or narration in your head for Bluebird or did it always perform silently? Staake: I never once considered using text to tell the story; but pages “speak” on an almost theatrical level, so if there’s any semblance of “narration,” that comes from how I stage the actions from panel to panel. Anyone who has written or illustrated a picture book is in essence narrating a story from page to page—either through the use of text or art—but in Bluebird I asked myself on each multi-panel, wordless spreads “what are these two pages saying?” The answer could be something as simple as “I’ve found a friend.” Or “A bird and a boy can play together in many different ways.” But in every instance I was trying to be clear—before letting the reader turn to the next page. Q: Is there a specific storyline to Bluebird that you hope the reader gets or is it a bit open-ended in your opinion? Staake: As I worked on the story I became increasingly interested in how a wordless story like Bluebird essentially elevates the importance of the reader, and makes them crucial to the story itself. It provides them with a basic thematic outline, but then it challenges them to “fill-in-the-blanks” and determine what is really happening. The fact that one reader might interpret the story one way and the person next to them might interpret it in a different way—I believe that’s a very, very powerful by-product of a plot that is calculated to be more open ended than didactic. Q: Was it a more challenging experience to create a wordless book than your text books or is every book different, period? Staake: Many of my picture books are written in rhyme, and that is in and of itself a challenging experience, especially when you’re trying to find a word that rhymes with “orange.” But the thing is, I have always loved putting limitations on myself when writing or illustrating books because they force you to communicate in unexpected ways. I’ve done books where I forced myself to draw all the art in one color, tell the story using rhyming stanzas, used die-cuts to reveal hidden words and images; and then in the case of Bluebird—no words at all. Self-imposing creative restraints might be annoying to other artists and writers, but I find they force me to travel down some very less traveled paths. Q: Were the panels or graphic novel-like frames originally a part of your layout or did they become necessary to better drive the story along wordlessly? Staake: If you look at each spread for Bluebird, you see that I try to keep the visual narrative flowing left to right in the same manner as text. But I also allow the reader to free themselves and let their eye drift from image to image in an imprecise sequence. If they look at a spread, they will take in ALL the panels of art in no particular order, but will still know what the big “message” of those two pages is. Again, this was a conscious effort on my part to trust that when you challenge kids to really LOOK at art and ask them what’s REALLY going on here, they can figure it out. Q: Is there a soundtrack that you hear for Bluebird? Staake: No, I’d have to leave that to others. But in fact, there IS a soundtrack TO Bluebird. It was written by Jerry Brubaker and performed by the Manassas (VA) Symphony Orchestra and can be viewed on YouTube. I saw the world premiere of the symphony in December of 2013, and I have to say that it was exactly the music I would set to the story, IF I knew how to write a brilliant, multi-instrument musical score. 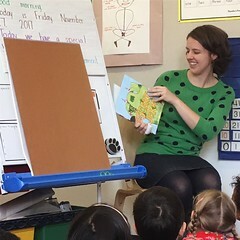 Q: In your interview with Jules at Seven Impossible Things Before Breakfast, I really appreciated your theory that “looking is a form of reading.” With this in mind, do you consider wordless picture books a better solitary experience or more exciting as a read-aloud? Staake: Looking IS a form of reading. I’ve always felt that way. Even as a kid, and even as people around me (parents, teachers, etc) would extol the virtues of the words in books, but if I’d get caught up and lost in the pictures—that was somehow lesser in value. The truth is that pictures are loaded with tons of information and by immersing yourself in them, stories become revealed. I just wish more parents and teachers understood and appreciated this and paid the same level of respect to the literary merits of imagery as they do to sentences and paragraphs. 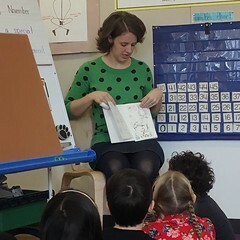 That said, I find it a challenge to read a wordless book like Bluebird to a room full of 1st graders. When the bird is hit by the stick they all gasp, but it is the conversations that take place after the story is finished that I find so revealing. Every kid has a different interpretation of the story—and that couldn’t make me happier. Q: Have you ever shared Bluebird in a storytime? 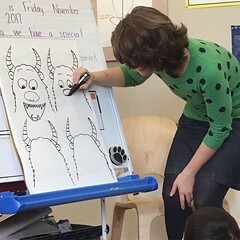 Do you have tips for how it or any other wordless picture books could be read aloud? Staake: I suppose you’re asking the question because Bluebird might be considered too emotionally “heavy” of a story to be read at bedtime? First, I have to point something out; one can ASSUME that the little bird is killed in the story—and that is fine to interpret it that way. However, when I look at the art I see him being “resurrected” and while he could be flying up to Heaven, he could just as easily be flying off to return another day. The only wordless book I have read to kids has been Bluebird which I present on a screen as a fairly elaborate Powerpoint. In that format it has a very theatrical sensibility and the art almost appears animated. My hunch is that this is the best way to read any picture book—think of it in theatrical or film terms. Don’t be afraid to be deadly silent for effect, stretch out sequences when needed, speak in a staccato and brisk pace to suggest urgency, and have the courage and restraint to let the pictures tell the story. Thanks to Bob for joining the conversation and especially for starting conversations with this beautiful book. It is a delight to ponder and read. That was a really fun interview! Thanks for sharing this at Booknificent Thursday!